It’s hard to know where to begin with Gods of Egypt. I suppose it’s best to first ponder how a film this profoundly incompetent and mercilessly dull could ever merit a wide theatrical release in the first place. How a colossal failure like this could even get greenlit is beyond me. To watch this movie is to witness a production collapse at every conceivable level but Gods of Egypt is unique in one sense: it powers valiantly though its ridiculous story under the pretense of entertainment when most other bad movies would have the good sense to just throw in the towel early. Set in a world that only vaguely resembles ancient Egypt, the plot begins with the coronation of the god Horus (Nikolaj Coster-Waldau) as the new leader of the land. 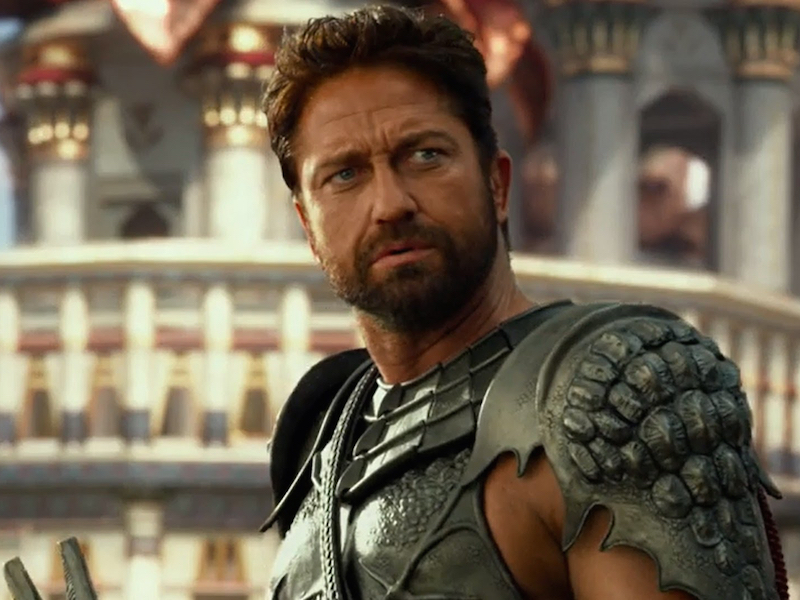 After the ceremony is broken up by Horus’ bitterly jealous brother Set (Gerard Butler), a fight scene ensues that makes a battle from a video game like Tekken look credible by comparison and Horus is left eyeless and forced into exile. With the help of his grandfather Ra (Geoffrey Rush) and the mortal underdog Bek (Brenton Thwaites), Horus seeks vengeance on his warmongering brother and hopes to restore peace and order to the land that he was meant to rule. If I had to pin the movie’s problems down to one point, it would be this: not one element of it feels remotely authentic or believable. Not only do the computer generated effects consistently look stilted and out-dated but they pervade every inch of every frame and call attention to themselves in a relentlessly unpleasant fashion. Everything feels about as far divorced from the live action format as you could possible get, which leads me to wonder why the producers didn’t just commit to creating an entirely animated film at the outset instead of clumsily inserting its stars in front of endless green screens. The actors hardly add any degree of plausibility in their performances anyway. The cacophony of irrelevant and distracting accents makes for a shaky foundation to begin with but the more troubling aspect is how little it feels like any of the performers are striving for anything resembling honest human behavior. There’s a noticeable lack of chemistry between the actors and they all seem to be embarrassingly out of sync with one another. No one is spared from a sub-par performance here but the most egregious among them is Gerard Butler, who I have all but given up on entirely at this point. Director (“victim” may be more fitting) Alex Proyas hit creative gold in the 1990s with inventive tales like The Crow and Dark City but he’s clearly lost his way since then and maybe this will be enough to steer him away from big budget fare in the future. Perhaps another director could have brought out the campy elements of this silly premise to push it into “so bad it’s good” territory but Proyas’ leaden sense of self-seriousness weighs things down indefinitely. It’s enough to say that Gods of Egypt is epically inept and one of the most truly bewildering experiences I’ve had in a movie theater.